Background: Inflammatory Bowel Diseases (IBD), are considered a growing global disease, with about ten million people being affected worldwide. Maintenance of intestinal barrier integrity is crucial for preventing IBD onset and exacerbations. Some recent patents regarding oily formulations containing probiotics (WO2010122107A1 and WO2010103374A9) and the use of probiotics for gastrointestinal complaints (US20110110905A1 and US9057112B2) exist, or are pending application. Objective: In this work, we studied the effect of a fixed combination of registered Lactobacillus reuteri and Lactobacillus acidophilus strains and herbal extracts in an in vitro inflammation experimental model. Methods: Caco-2 cell monolayer was exposed to INF-γ+TNF-α or to LPS; Trans Epithelial Electrical Resistance (TEER) and paracellular permeability were investigated. ZO-1 and occludin Tight Junctions (TJs) were also investigated by mean of immunofluorescence. Results: Pre-treatment with the fixed combination of probiotics and herbal extracts prevented the inflammation-induced TEER decrease, paracellular permeability increase and TJs translocation. 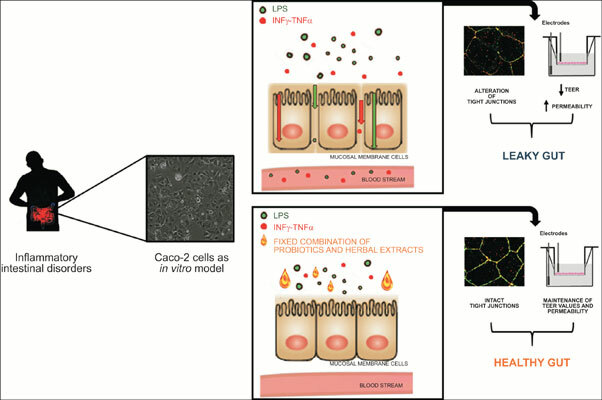 Conclusions: In summary, the fixed combination of probiotics and herbal extracts investigated in this research was found to be an interesting candidate for targeting the re-establishment of intestinal barrier function in IBD conditions. IBD, Caco-2 cells, Lactobacillus reuteri, Lactobacillus acidophilus, Trans Epithelial Electrical Resistance (TEER), adherence junctions proteins.